AudioLink Cable Series, Other Cable/Connector from Alesis. 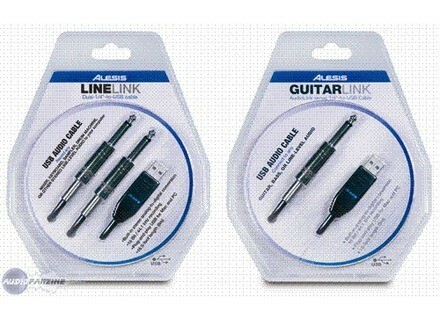 Alesis has announced that its series of AudioLink USB audio cables are now in stores. The AudioLink series includes GuitarLink, a quarter-inch-jack-to-USB cable; MicLink, an XLR3-to-USB cable; and LineLink, a dual-quarter-inch-jack-to-USB cable. For more info on this product, check out our previous piece. GuitarLink, MicLink and LineLink are available now from musical instrument and pro audio retailers. MicLink and LineLink have suggested retail prices of $79.00 and are available in stores for approximately $49.00. GuitarLink has a suggested retail price of $69.00 and is available in stores for approximately $39.00. Lava Cable Gotham GAC-1 Ultra Pro Lava Cable has announced the addition of Gotham Audio's latest instrument cable, the GAC-1 Ultra Pro.